We offer a wide range of services from grooming to pet sitting and dog walking. Our dog grooming prices are based on size, breed, grooming-style and time required. After the first consultation I will be able to give an estimated quote after assessing the coat condition and your particular grooming requirements. An average full groom will take 2 to 3 hours for most dogs although my theory is it takes as long as it takes, some dogs do need more time especially if they are unsure about having their nails trimmed, are severely matted or just plain old grumpy. Specialist hand stripping does take a lot longer so costs a little more but doesn’t need to be done so often. Hand stripping is recommended for non shedding breeds to give a more natural finish and keep the coat waterproof for dogs such as terriers and spaniels. Doggy Treats are available throughout the groom. I am fully insured and I am happy to provide proof of this upon request. All dogs need to be vaccinated (kennel cough not required) and with proof of annual up-to-date boosters to ensure your dogs and other dogs that visit the salon complete protection again the spreading of harmful viruses. WOOF & READY ARE MOBILE! At Woof and Ready we understand that not everyone has a car to come to the salon so that’s why we offer a collection and drop off service for a small charge (around 3 to £5 to cover fuel for both ways). Rather than grooming in your home which means hair in the bath, using your electric supply to dry and the dog being overly excited every time a member of the family walks by we prefer to bring your dog to us in a safe and calm environment where we can use our professional equipment. So if you are elderly and can’t get out, a busy mum with no time to spare or it’s just easier for you please let us know and we will collect and drop off upon request. 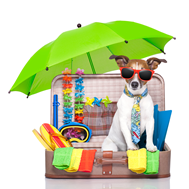 Going on holiday and need a pet sitter ? Or a trip to the vets? Look no further – having kept animals all of my life ranging from reptiles to horses I have lots of experience in looking after your pets whilst you are away. I offer pet sitting in your home for all sorts of animals or you can bring your dog to me where they will live as part of the family and have someone around most of the day. NB: Dogs that are severely matted will incur a £5 per extra half hour charge. A full clip off May be required and will be discussed at the consultation. Balancing busy work life can be tricky when you own a dog, having that extra hour in bed in the morning or putting your feet up after a hard days work is sometimes all you want to do when you return home. Woof and Ready can take care of your dog and give him the exercise and play time he needs to be a happy and healthy. We can offer solo walks but most dogs love the company of others to chase around and have some social time, an assessment of your dogs walking with others is always undertaken to ensure all walks are happy with tails wagging. Whilst crate and toilet training your puppy, it is essential if you are at work for longer periods to have your dog let out. Puppies have smaller bladders and need to build up the time they can be left alone in a crate or at home, it is important to get this right to avoid accidents or cause your dog stress. We recommend an hours visit in the middle of your working day which can include a short walk (dependent of the dogs age) and then lots of play time. Puppies like babies need more regular feeding so we can also ensure you dog has lunch and water. We charge £10 per hour or £7 for half hour visits. We walk wherever our tail takes us, We can cover all areas within an 8 mile radius of Derby city to include Elvaston, Littleover, Mickleover, Allestree, Mackworth, Morley, Chaddesden, Spondon, Ockbrook, Borrowash, Allenton, Chellaston and many more. We walk at flexible times to suit you with no more than 4 dogs, rates are from £10 per hour with a second or multiple dogs from the same household discounted at 50% off. High velocity hand dry – no cage drying here! We prefer for our customers to make a repeat booking for your dog to visit every 6-10 weeks (breed dependent), and as a reward we will offer you a discounted rate for your loyalty.